Well Theresa has been giving us some hassles. We were at Matt's parents on Sunday Sept 21, Theresa was playing in the backyard. She tripped and fell on the grass. She cried for a while and complained that it hurt. She went to bed and we didn't think much about it. The next morning we asked her if she was ok and she said yes. She went to her school were they work on her gross motor skills. They had her do a bear crawl and she started crying because it hurt. I figured give it another day and see what happens. I took her to Tutor Time on Tuesday morning and she fell on her wrist as we were walking into the classroom. She cried for about 10 minutes then told me it was ok to go to work. I called and made her a doctor appt because I was concerned why she was falling all of sudden. Well the doctor wanted a x-ray and comes to find out that she has a buckle facture on her wrist. 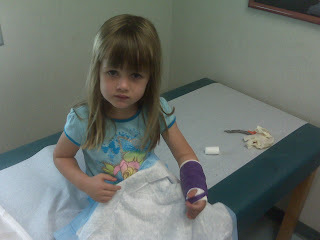 She had an appt with the orthopedic the next morning to get a cast. Meantime that she fell on her wrist again at home on Tuesday. I thought maybe ear infection but it was all ok.
Theresa now has a purple cast and she thinks it is the greastest thing in the world. On thursday Theresa decided to fall again in the rosebushes this time. She scratched up the insde of her leg pretty good. We have now gone almost a week with out a fall so I think she was just at an akward growing cycle. Some good news Matt & I joined the YMCA and we are going to work out at least 3-4 times a week. Matt is supposed to be getting gastric bypass surgery so we figured might as well start the work out now. Good job on the going to the gym. I've been going regularly, but I'm still eating too much food. We should start a Clobes Family Biggest Loser! We each chip in 50 bucks on the winner keeps the cash?